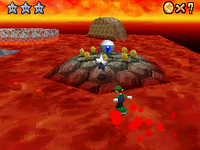 Lethal Lava Land is the seventh course of Super Mario 64 and Super Mario 64 DS. The entrance to the course is the large painting with a menacing-looking fireball located in Princess Peach's Castle's basement. The course has many platforms situated over a pool of lava with a volcano in the center of the course. The player starts off on a platform with a couple of signs and the player has to Long Jump in order to reach the next platform. This platform splits to either a small, circular platform on the right that contains a ! Block with a Shiny Shell inside during the later missions and a platform to the left that has several Bubbles jumping across it. At the end of the left path is a large platform with a single Bully. Here, the platform splits and leads into either the left or right side of the course. 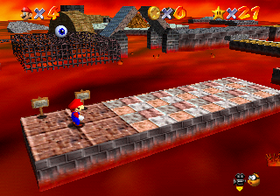 To the right is a lava plume and a ramp and platform that lead to the spinning, ring platform that circles the volcano and a flamethrower with a 1-Up Mushroom on top of it at the back of the platform. If the player stands on this platform, it will slow to a halt, the volcano will erupt, and then the platform will resume moving. To the right are platforms that lower and rise in and out of the lava. Here, the platforms lead to either a circular platform with a trio of Bullies or an "M"-shaped platform. The platform with the Bullies has a steel-grate platform that will bring the player to a rolling log. The "M"-shaped platform will lead to four sinking and rising platforms with a large platform with a trio of Bullies, where a Big Bully will be fought if the player defeats the normal Bullies. To the left of large platform with the Bully is a drawbridge leading to a steel-grated platform with a Mr. I and a warp underneath it. The warp leads to a small platform containing a Wing Cap. Past the Mr. I is a platform tilting in and out of the lava with a group of sliding puzzle platforms with Bowser's image. Beyond the Bowser puzzle is a platform with a couple of Bullies leading to a spinning platform with a Fire-Bar, and a couple of platforms beyond that lead to a Big Bully. Jumping into the volcano in the center of the course will bring the player to the inside of the volcano. The volcano has several platforms that ring around the volcano's walls and lifts that spiral up to the top. There are several Bullies, Bubbles, Fire-Bars, and flamethrowers along with a large, falling obstacle that will attempt to flatten the player if they get close. The platforms can get small near the top of the course and there are several poles the player has to jump between as well. If the player loses a life in the volcano and re-enters the course, they will be brought back to the inside of the volcano without having to go though the main course again, provided the life lost doesn't result in a Game Over. Super Mario 64 DS This mission's objective is to defeat the Big Bully at the back platform of the course. Super Mario 64 DS The mission's objective is to defeat a trio of Bullies on a back platform, followed by a Big Bully. Super Mario 64 DS This mission's goal is to collect the eight Red Coins on the Bowser puzzle. Super Mario 64 DS This mission involves using a rolling log to reach the Power Star. Super Mario 64 DS This mission's objective is to collect the Power Star at the top of the volcano. Super Mario 64 DS This mission involves using the elevators inside the volcano. Super Mario 64 DS This mission's objective is to collect the Silver Stars around the main course. Spinning Heart: Inside the volcano, past the crushing wall, on the platform to the right. Homing Mushroom : #1 Inside the volcano, in the highest pole. Static Mushrooms : #2 Behind the platform the "Boil the Big Bully" star appears on. #3,4 Two mushrooms can be found on two brown high ramps. #5,6 Two others can be found on small white ramps. #7 The last static mushroom can be found on the top of the fire shooter behind the volcano. Triggered Mushroom : #8 Appears after the player runs around the spinning platform with flames past Bowser's puzzle. The area under Mr. I near Bowser's puzzle can warp the player to the island with the Wing Cap. The spinning platform with the Fire-Bars in the northeastern section of the main course will not hold Bullies when they are pushed onto it, causing the Bullies to fall through it. 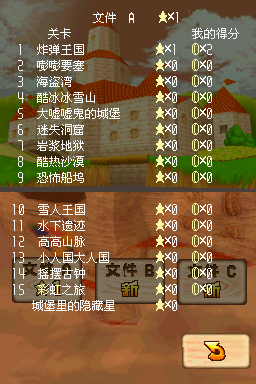 In the DS version, this course is the only course where any character can collect any star. It is also the only course that allows Mario to obtain his Power Flower and Flying abilities without having to go somewhere else. This page was last edited on April 5, 2019, at 11:58.